Why Not to Rely on RSI and Stochastic Indicators - Find the best FOREX Brokers, FOREX Bonuses, FOREX Signals, FOREX News, FOREX Rates and everything FOREX related on Forex Directory! RSI and Stochastic indicators seem really appealing for determining market movements and many young and new traders tend to use them but both are not 100% reliable when it comes to predict market tops and bottoms. When RSI is below 30, the market is said to be oversold and when it is above 70, market is considered overbought. In case of stochastic indicators, market will be oversold when it is below 20 and when it is above 80, market will be overbought. Why are they Considered Helpful? People consider these indicators helpful because they often tell you the right time to enter good quality trades and are hence said to bring good luck. But when we scrutinize them through Forex perspective, many experts think that RSI and stochastic indicators are pretty much ineffective. Experts suggest a minimum use of these indicators; some suggest a combination of these along with some other technical indicators for better strategies but many of them do not even include these indicators in their trading charts because of their limited use. However, their behavior is not consistent. They can sometimes very accurately indicate the end and beginning of a trend but other times they render completely worthless. As an example, let us assume that the market trend is strongly moving downwards. The RSI can fall below 30 and the stochastic indicator can also reach below 30 levels. The RSI could rise back again and then go back to the same position but your trading positions will hold no value in such a case. You can get into a lot of trouble since these indicators will be useless in this falling market. Similarly, if the market trend appears to be in strong upward direction and it continues making new highs. So the RSI can reach above 70 and stay there for some very long time. It can also fall below 70 in case that the trend slightly reconstructs and then goes back to the same position when the trend rises again. This obviously means that if you take short positions when RSI is above 70, those positions will be stopped at every new rise or retracement. 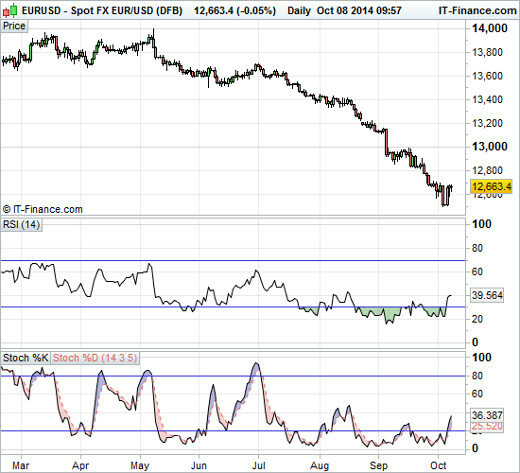 As an example, take a look at the EUR/USD chart. The chart is the proof that these indicators cannot be trusted. They were indicating oversold condition for many weeks but the price was only moving downwards. Hence, had you used RSI and stochastic indicators for calling trades, you would have called a bottom. And every time, your position would be stopped out. This not only applies in long-term charts but it also goes for the short-term charts. This tells us that one cannot rely on these two indicators for predicting market tops and bottom. There are many other more useful and easy-to-use indicators which you can use alternatively. You can use candlestick patterns such as pin bars and spinning tops. If you are serious into trading price reversals, there are other far more effective methods. For example you can look for divergence patterns on indicators such as MACD and MACD histogram.